It was 5:30 in the morning when I left the house. Last night my landlord insisted to take me out for a farewell dinner. After that we had a long talk. I did not start packing until it was very late. After half a bottle of wine from last night and very little sleep, my mind was surprisingly fresh in the morning. I boarded the Malaysian Airline shuttle bus to transfer to the airport in the Malaysian side of the border. The bus ran on a highway that bisects Singapore's tropical rain forest. Alone, I looked through the window. It was misty outside. The twilight was deep blue. Today I was leaving the country I have lived for the past year and a half. Goodbye, Singapore. In 1995 I have moved from Hong Kong to Singapore to work for this small company. I have settled in quickly. Everything has worked out fine. I enjoyed the tropical weather and the relative spaciousness. Nonetheless I have never planned if it should be a short term or a permanent move. Then one day it has come to me that it was time to move on. This decision has actually set myself free. Not longer was I fixated on career, I decided I want to spend some time traveling. While I had no specific destinations in mind, I wanted to start with the neighboring countries. An idea quickly emerged. I will travel all the way home to Hong Kong! 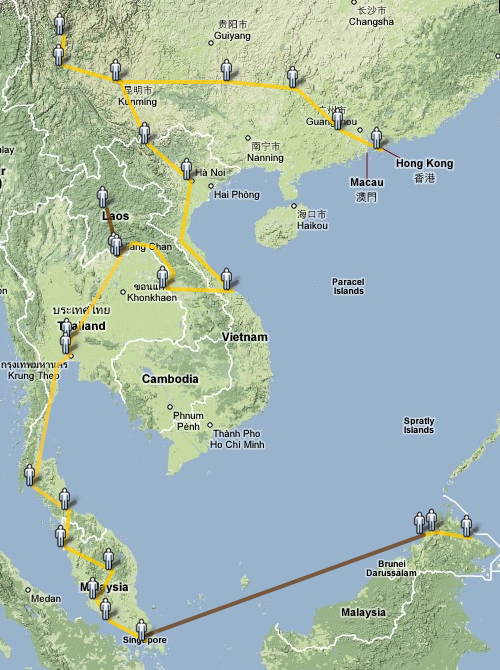 Malaysia, Thailand, Laos, Vietnam, and southern China, it will be an overland trip that also serves a purpose of transportation! This time I have not bothered to find travel companions since it is unlikely for other people to join for an opened end journey. In any case, traveling solo turned out not to be a disadvantage at all. Not only was I free to make decisions for myself, I also have the pleasure to meet great many people. This often made the most memorable experience in the trip. It was such a spontaneous idea. From conception to setting off was only one month. After giving notice to my company, my last month involves doing some pre-trip planning, arranging funds, selling off my belongings and shipping other stuff back home. After everything was taken care of, I set off from Singapore with nothing but a small backpack. The following is the journal of my trip. For three months I have traversed many different cultures and landscapes. It is an experience I always cherish.